Growing up in Texas, breakfast tacos are a thing. 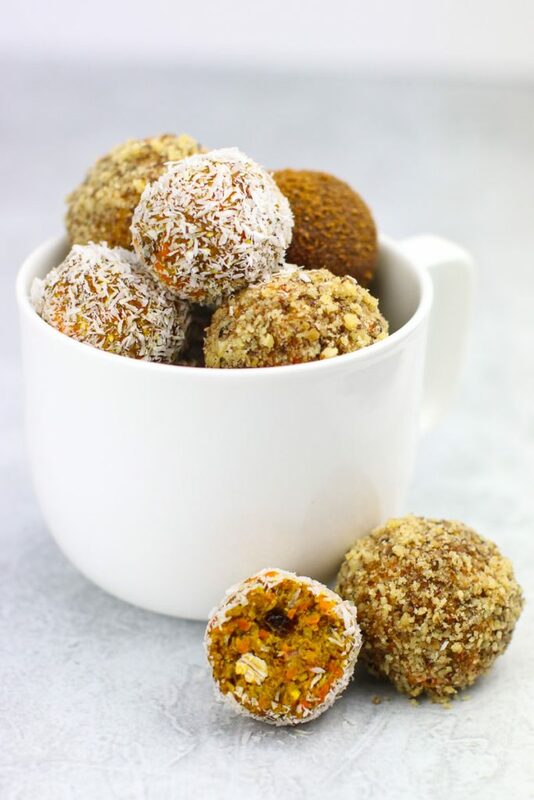 A big, delicious thing. One might even say a movement. When I first moved to the Pacific Northwest, I quickly realized there were no breakfast tacos to be found. PNW folks passionately defend the breakfast burrito, which is delicious in its own right, but it pales next to the taco. Breakfast tacos don’t struggle with the same potential for a soggy tortilla that a burrito does. Burritos are huge and they’re not easy to eat quickly. You can get through a taco quickly, which means fresh tortillas. Plus, the tortilla-to-fillings ratio is good – you can go spicier and more flavorful with a taco because you’ve got the tortilla to smooth it out. Convinced? Me too. Now, onto these delicious vegan breakfast tacos. Because it’s January, a time for beginning new healthy habits, I’ve also included a handful of additional healthy breakfast ideas from some of my fellow vegan bloggers. 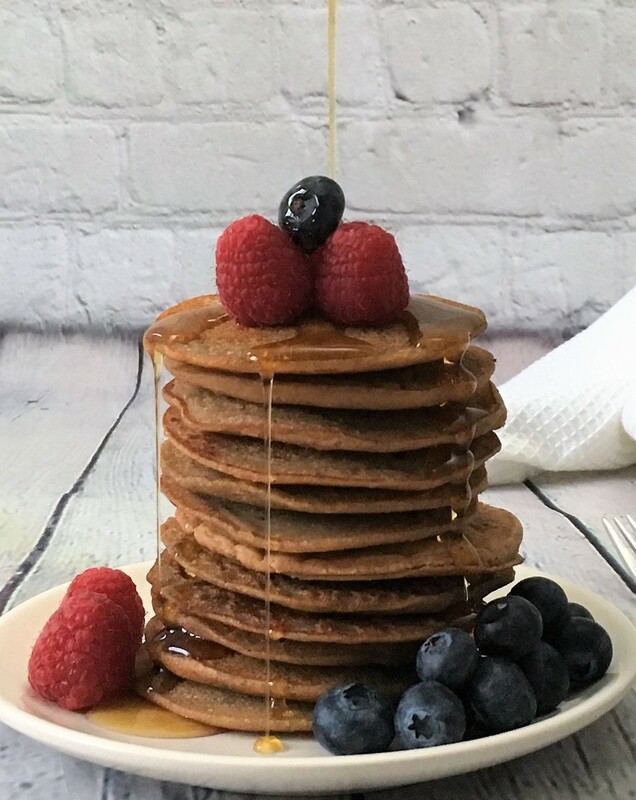 Scroll past the breakfast tacos recipe below for more recipes to get your year started right. what ingredients do you use for vegan breakfast tacos? This is a real ‘you do you’ moment.. Go classic (vegan style) with vegetarian refried beans and vegan cheese, cook up some potatoes, and top it all with salsa. 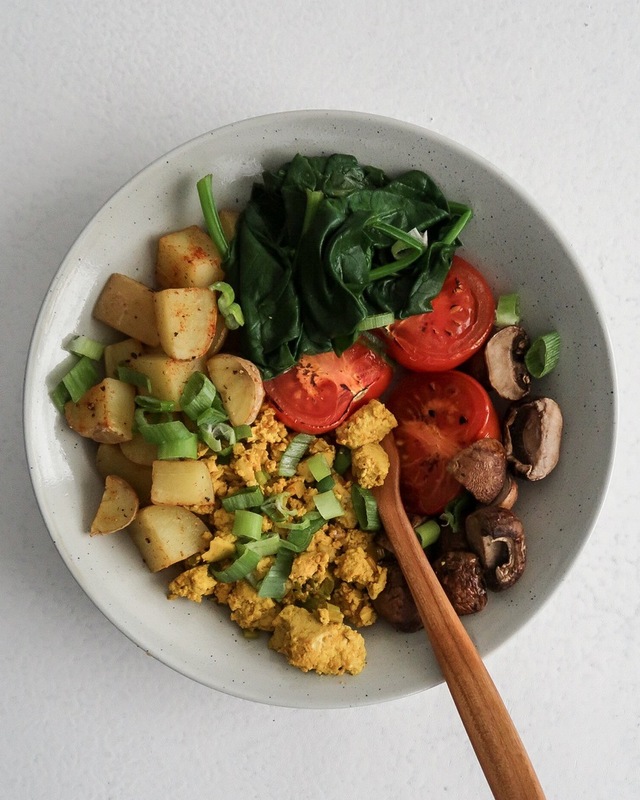 If you want a veggie scramble, try roasting zucchini, onions, potatoes, mushrooms, or really any vegetable lying around to add a little more character. 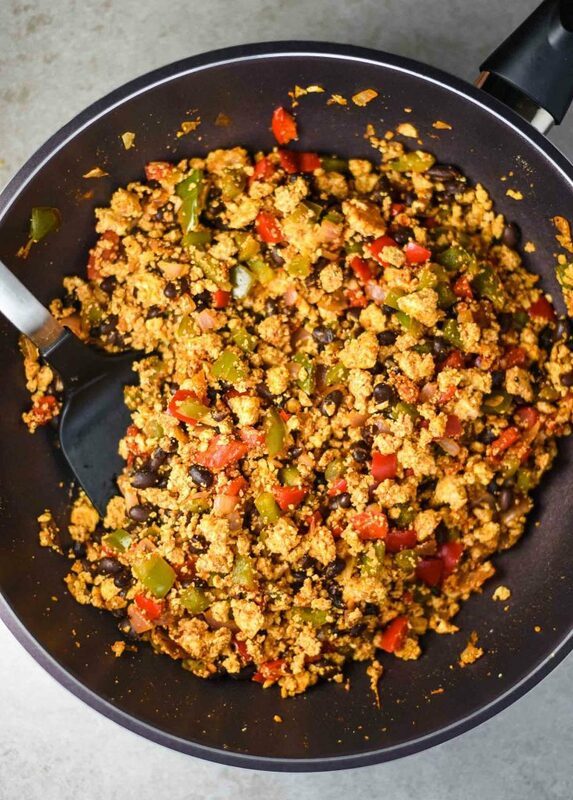 You could make vegan migas, grill some avocados, or make a delicious tofu scramble with black beans and bell peppers. The point is — breakfast tacos are vehicles for breakfast deliciousness and there are an infinite number of ways to prepare them. Have fun finding your own personal flair. how do you make vegan breakfast tacos? 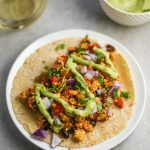 Breakfast tacos are meant to be simple and easy to make, and this tofu scramble breakfast taco recipe is no exception. Chop your veggies, crumble the tofu, add spices, cook on the stove, and dish your fillings in tortillas with the avocado cilantro sauce. The avocado cilantro sauce is a simply a nice-to-have, so if you’re short on time, you can definitely get away with just adding salsa and chopped cilantro. If you’ve got an extra five minutes, the avocado cilantro sauce is a creamy and tangy addition that provides balance to the warm spiciness of the tacos. where are breakfast tacos from? Texas is a tricky place to call my home state, so the answer to this question gives me great joy. Breakfast tacos are from Texas, with clear influence directly from Mexico. More specifically in Texas, Austin…but within Texas, there’s a lot of controversy around the specific location with. San Antonio also laying claim. If you’re hungry for some other breakfast ideas, scroll down for a round-up of healthy vegan breakfast ideas below the recipe, or check out these vegan buckwheat pancakes, avocado toast, vegan biscuits and gravy, and vegan golden milk. If you make these breakfast tacos, leave a comment, rate the recipe, and and tag a photo with #plantandvine. 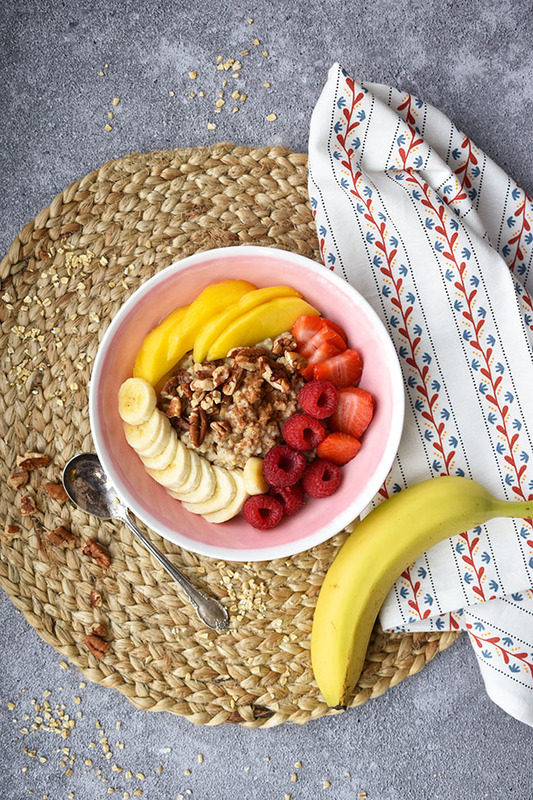 Love seeing your favorite ways to eat breakfast! Champagne: a classic breakfast wine suggestion for the traditionalists. The bubbles will keep your palate refreshed and the biscuit and bread notes will complement the tortilla. Zweigelt: light, tart, fruity red from Austria with flavors of sour cherry, raspberry, and black pepper. Adds a good pop of refreshing fruit flavor to your meal. If you’re hesitant to serve a red wine at breakfast, try lightly chilling to give it more of a fruit juice feel. Rosé: strawberry, rose petals, cherry, and citrus zest flavors with light, refreshing body and acidity. Rosé is a nice middle ground between red wines and sparkling wine that provides some of the complexity of red wine with the lightness of a white. Delicious and easy to make vegan breakfast tacos with avocado cilantro sauce. Wrap tofu block in paper towels, place on top of a cutting board, and sit a heavy object (cast iron skillet) on top of the tofu. Let sit for 20-30 minutes to drain out excess water. Heat a large pan over medium heat. 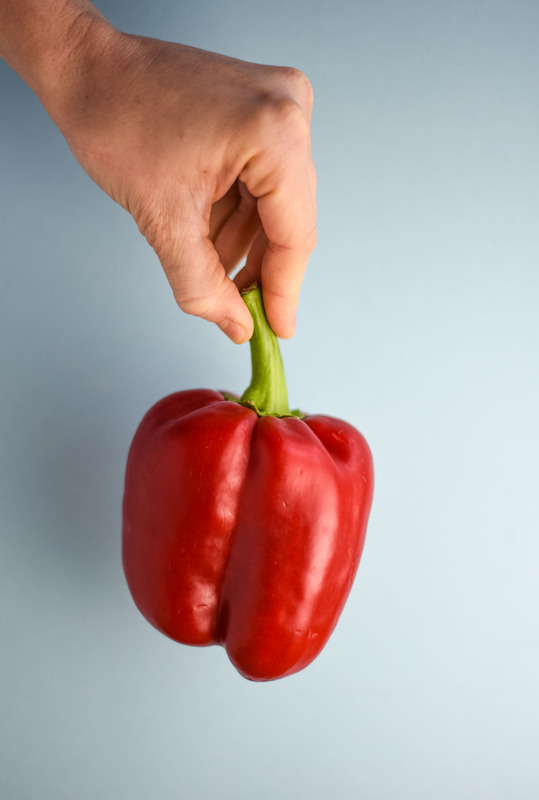 Add 1 teaspoon of olive oil, the bell peppers, onion, garlic and a hearty pinch of salt. Cook about 5 minutes, stirring occasionally, until tender. Push the veggies to the side of the pan and add remaining 2 teaspoons of olive oil. Crumble the block of tofu into the pan, using your hands, and add all of the spices. Stir everything together and cook until tofu is starting to brown, about 15 minutes. 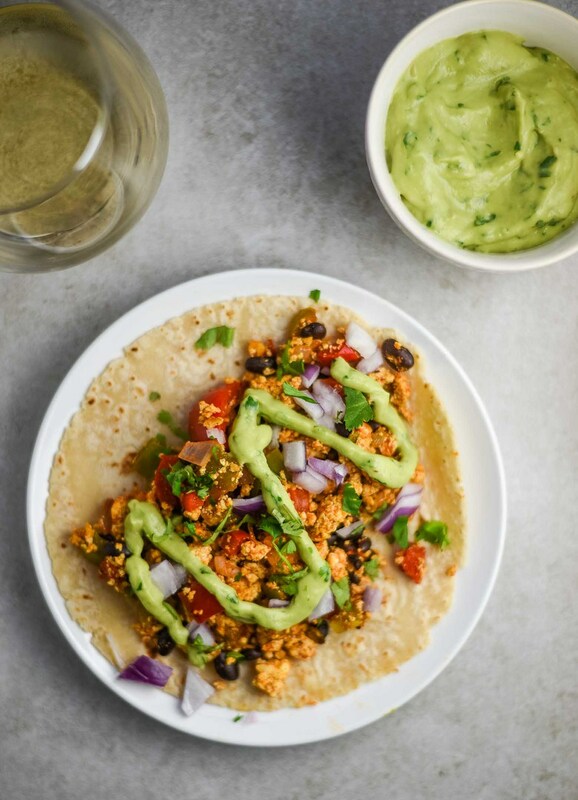 While the tofu scramble is cooking, make the avocado cilantro sauce by combining all ingredients in a food processor or Vitamix and blending until smooth. Add the beans, stir, and cook for 2 more minutes, until mixture is thoroughly heated. 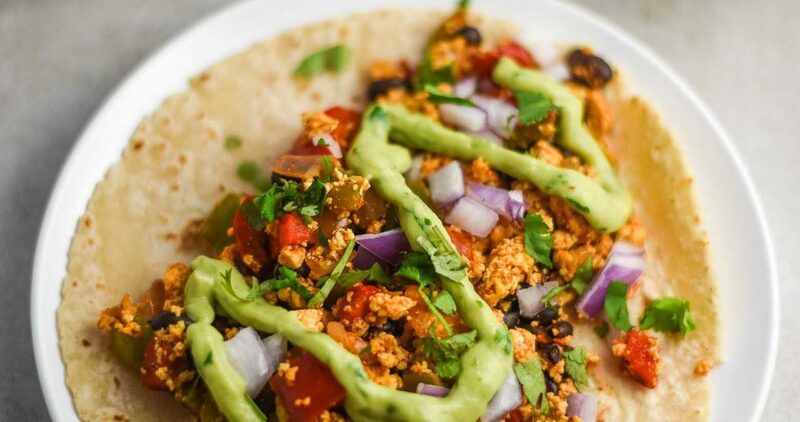 Serve tofu scramble in a tortilla. Top with avocado cilantro sauce, green onions, salsa, or cilantro. Best when fresh. Store tofu scramble in covered container in refrigerator for up to 4 days. 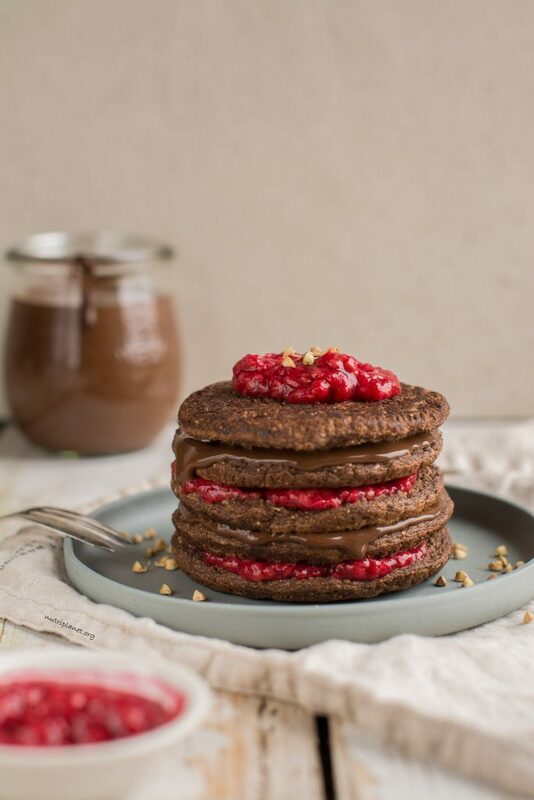 Check out these other healthy vegan breakfast menu ideas from my fellow vegan bloggers!